Florida, with its beautiful weather, is tailor-made to host the best art fairs in the country. The winter season should find you in Coconut Grove, Winter Park, Naples as well as Fort Myers, great hangouts for artists as well as for you. Join our Art Fair Calendar email list to be notified about updates on art shows as they become available. Do it today because you don't want to miss another great event! A nice event held on shady streets in a cool university town. Downtown in Cambier Park, one block South of 5th Ave.
Mainsail is held in a waterfront park with a wide variety of art from which to choose. This vibrant event features 200 artists chosen from 1,000 applicants, which assures some very good quality artwork. A well-attended event with art, shrimp and music. The wide variety of arts and crafts will give you many choices. Historic downtown Sanford is transformed into an artist mecca for the third annual St. John's River Festival of the Arts – A Fine Arts & Fine Crafts event! Stroll historic brick-lined streets lined with artwork from some of the best of regional artists. See Art-in-Action from live artist demonstrations. Create your own piece of artwork at workshops scheduled during the weekend. Enjoy gourmet tastes at our Culinary Arts Court while you listen to the sounds of acoustic performers. Come spend the day in beautiful historic downtown Sanford where there is so much to see and do! Fine Arts Show takes place on Saturday and Sunday only. South Florida Fairgrounds, 9067 Southern Blvd. Central Park along Park Ave., 251 South Park Ave. Under the auspices of the Gainesville Fine Arts and the Thornebrook Merchants Associations. Also expect to find children's activities, entertainment, and food vendors. Everyone loves Cedar Key with its wonderful laid-back atmosphere, so here is another excuse to be there. Expect artists, craftspeople, great food, and live music at several places around town during the days and nights. Manatee Sanctuary Park - new location! Great Gulfcoast Arts Festival, Inc. This fine event is put on by volunteers and is a not-for-profit organization and as such, is the best art festival in this part of the state. Patrons travel from as far away as Atlanta to enjoy this pleasant event. On the Park (new location), 151 Graham Ave. Downtown in Cambier Park, one block south of Fifth Ave.
Lake Lily Park, 641 S. Maitland Ave. In its 22nd year, ArtWorks is a "plein air" show which takes place in the historic district of Eau Gallie. There will be live entertainment, food, fun, and plenty of art during this two-day festival. Central Ave. between 4th & 6th St. Situated lakeside along the meandering paths of the beautiful Memorial Park in downtown Stuart. This event brings out some of the finest artists in the U.S. to meet the Florida marketplace, a juried show of high-quality contemporary objects including jewelry, clothing, furniture and home accessories. 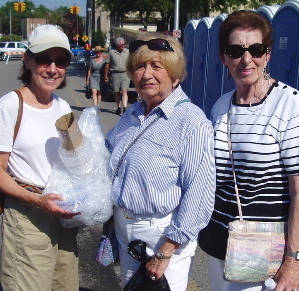 Art and craft show goers will enjoy leisurely shopping under the beautiful array of shaded oak trees where they’ll find fabulous and creative one-of-a-kind gifts. Voted top 100 art fairs in the nation, this juried fine art and fine craft show showcases top-notch quality artists from around the globe to sell their original and personally handmade artwork in all disciplines. Expect great food by local area restaurants and wonderful local entertainment. There is something for everyone – with in all price ranges. The oldest art fair in Florida is presented in a beautiful setting on campus, wintering artists from across the country unfurl their newest works for their patrons. A perfect combination ... art and the beach. Palm Beach Co. Convention Center, 650 Okeechobee Blvd. Fleischmann Park, 1600 Fleischmann Blvd. Artists from across the country gather in this lovely park to show their work. A wonderful show setting on the Intra-coastal, very laid back and easy to view. A great place to visit a show and take home something special, a part of the annual Old Island Days in Key West. It has a wonderful old hippie atmosphere with many works including indigenous materials. Wellington Amphitheater, 12100 Forest Hill Blvd. "The Best Little Art Show in Englewood"
The prestigious Palm Beach Fine Craft Show makes its triumphant return to the Palm Beach County Convention Center February 15-17. 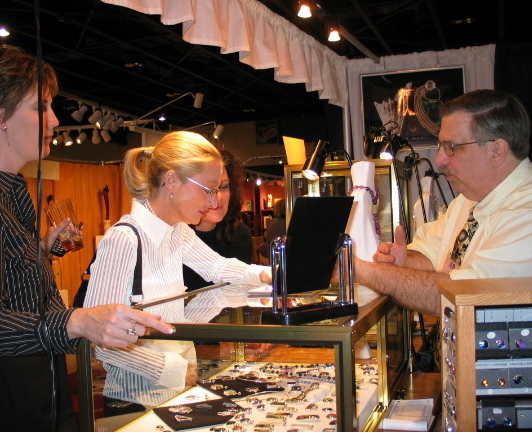 This is a dedicated Fine Craft Section of the Palm Beach Show Group's Annual Art, Antique and Jewelry Show. This elegant showcase features 135 of the nation’s top contemporary craft artists, offering their latest celebrated works in a comfortable, indoor setting. An excellent committee works year-round to present this fine art fair in a premiere location. Easy access and great restaurants add to the fun. A very popular well-attended event; lots to see and lots of fun. 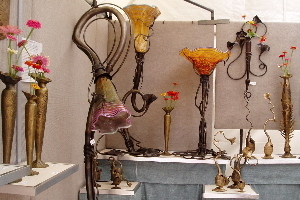 THE big Florida show – fine art and craft from nationally known artists, a chance to see the best! This is a dedicated Fine Craft Section of the Palm Beach Show Group's Annual Art, Antique and Jewelry Show. Easy to attend, great for families! More traditional work can be found at this event in a lovely park in the heart of Naples. A great place to buy tropical-themed artwork in a fun setting. 600 East Las Olas Blvd. Big prize money brings artists out of the galleries to a cutting-edge show. Enjoy the artworks of 200 National and International artists while supporting the many programs of the Center for the Arts. Continuous entertainment, food, and beverages, featuring artists from throughout the US. Local restaurants offer their specialties; continuous, live, local musicians on stage, artwork raffle, free parking, free admission. Presented by the Anna Maria Island Art League. Beautiful Central Park in downtown Winter Park hosts this fine event for the 60th time. Over 1000 exhibitors apply for the 225 spaces that are spread through the park. Expect to see dazzling sculpture and glass for the big pocketbook, as well as smaller works to please just about anyone. This is a classy event that only showcases the best in a dignified atmosphere. Great food and sidewalk cafes beckon you to stop and enjoy the day. A quaint village, a great place to spend a weekend shopping for treasures. Please join our email art fair calendar list below to be notified about updates on the Florida art show schedule as they become available. Join today because you don't want to miss another great event! ArtFairCalendar.com provides these listings for free as a public service. The constantly changing art fair business means that we cannot be held responsible for inaccurate listing information or typos. Please contact the promoters of each event to confirm specific attendance details before making your plans. To receive regular updates on the fine art fairs in your area, please join our email list. I was wondering if I could get any advice from you. I'm selling art pieces from different up and coming artists from Latin America. For what I can see several of these shows only allows the artist to sell their work. I would like to see if anyone could advice me into what shows I should try to get in. Oh btw I live in West Palm Beach. Hello Pat and thank you so much for alerting us to the changes to the Bonita Springs Art Festival. Unfortunately very few shows contact us when they make changes to their shows. We usually discover those changes as we look for the new show dates. I appreciate that you took the time to send us this information. We will be updating the show today. 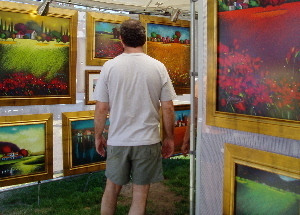 Under the Bonita Springs Art Festival for Bonita Springs Florida (ie. March 14th & 15), you have the setting as "upscale shopping center plays host", but it is now in a Park setting (Riverside Park). It also lists both the park address and the Bay Rd address (which belongs to the old shopping center location). Could be very confusing to first time attendees. Thanks for revising. Hello N. Floden, Your question is not easy to answer. It depends where you live. Greeting cards would probably sell better at a craft show. We list art shows here. You may need to buy certain supplies to sell your product. Most indoor craft shows issue the crafter a table. Art shows usually require the artist to own a certain kind of tent. You might try googling craft shows in your state. You could also join us at www.ArtFairInsiders.com. We have a crafter's forum there and you could ask questions in there. Good luck. I make 2, 3,4 and more dimentional cards for birthdays, anniversaries, get well, sorry for your loss, Friendship, Christmas and more. Where would I find a place to sell them? Hello Linda. The little asterisk is a notation for me. It lets me know that I have checked and verified those dates. If the show doesn't have the asterisk I know that I still need to get those dates. The asterisk just makes it easy for me. What does the * asterisk mean after the dates? Not all the listings have one. Hello Carol, If you woud like to apply to that show, copy and paste the link into your browser - http://artinusa.com/bonita/. You will find all the information you need to apply to the show. Do it soon because you never know when their application due date is. I am interested in the show on Jan. 10th and 11th in Bonita Springs. Whom do I contact to sign up for that show? Hello Ruben, if you would like vendor information you will need to contact the show. We don't have anything to do with the artists or the food vendors that get into the shows. We only list the shows. Good luck. Hi, I would like to receive information about the requirements on how to participate as a vendor (food industry). Hello Steve, you have art work done by those famous people? If you do, you will need to contact an art gallery or something like that to see if you could sell them there. All of the shows listed here on the Art Fair Calendar require all art work to be made by the person that is selling the work. A second party person can not sell the artist's work. Show directors are adamant about that, too. So, you will not be able to sell any of that art work at any of the shows listed here. Sorry about that and good luck to you. You might try Ebay. We have a very unique collection of authenticated artworks done by various global icons, such as Nelson Mandela, Gary Player, Pele' and Jack Nicklaus. How can we get into contact regarding submissions, or with someone in charge? Hello Amy, Thanks for sending us your dates for the Leesburg Art Festival. I have corrected them on the Art Fair Calendar. We work about 6 to 7 months out looking for the upcoming show dates. We try to be as correct as possible when listing shows. Unfortunately, sometimes we find dates for shows that may not be correct. The best way to avoid having incorrect show dates for your show is to send your show dates to jacki@artfaircalendar.com about 6 months before your scheduled show. We would love that and you would be assured that the correct show dates are listed with your show. I look forward to receiving your future dates. Leesburg Art Festival is March 8 and 9, 2014. Hello Alex. Good luck to you on getting into some art shows this year. Check out www.callsforartists.com. You will find many shows there that you might like to apply to. That's great! Thanks for sharing the art show calendar. I am interesting in coming to Panama City this year and possibly participate with my photography in one of the shows in 2014. Hello Sue, glad you had a great time. It is a little too early for us to have next year's show dates. Check back often. As soon as we know them, the 2014 dates will be added. and when is next years event in Oct @ Mac Intosh in Fl. I am on the board for the Nov 1-3, Great Gulfcoast Arts Festival, how do I change the listing information to include our website; ggaf.org ? Thank you, Enid. We work hard to bring the best art shows to art patrons all around the country. ArtFairCalendar.com - Fine Art Fair and Craft Show Listings: Florida Fine Art Fairs and Craft Shows This is awesome! Hello Maria, the little asterisk means that the show information is up to date for the current calendar year. The asterisk is basically there to help me know which shows need to be updated. And now you know.